love, laughter and happy memories. Wendy, thanks for sharing this most precious picture with us! Merry Christmas to you and your family. I hope that the rest of 2011 and 2012 will be wonderful, filled with lots of good books!! Hugs to you! I love the photo! Merry Christmas to you and your family! Merry Christmas, Wendy and family! What a sweet picture! Merry Christmas to you and to your family! What a beautiful picture! Just stopping by to wish you all a very Merry Christmas and all the best in the New Year Wendy! That photo just makes me happy!! Merry Christmas to you and your sweet little family! What a magical picture! It warms my heart to see a father/daughter moment like this. Enjoy little Mouse's first Christmas! Merry Christmas, Wendy! That's a lovely photo!! I love that photo - it looks like it could be a painting! Hope you had a wonderful Christmas! Beautiful picture! Adorable! I hope you and your family had a wonderful Holiday. I hope you had a very Merry Christmas, Wendy! Beautiful picture! Hope you guys had a wonderful holiday Wendy! Such a sweet photo. 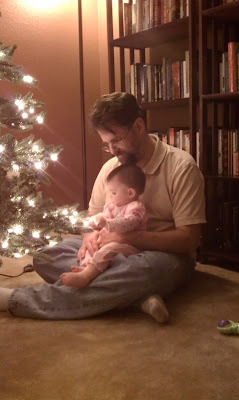 I hope that your first Christmas with Mouse was a beautiful one. Thank you, Everyone! This is my favorite holiday photo and I just had to share. :-) Have a great New Year! I know it's really late to comment on a Christmas post, but I had to, Wendy. What a beautiful photo. Hope the day was as precious as that picture!